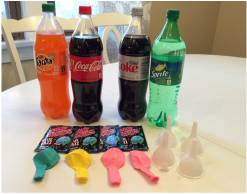 Which soda will produce the most carbon dioxide gas to fill a balloon when mixed with Pop Rocks candy? ​Our hypothesis is that the Pop Rocks candy will dissolve into carbon dioxide and blow up the balloons with gas. We believe that the balloon on the Diet Coke bottle will fill up the most because Diet coke has aspartame and potassium benzoate. Step 1: Place a balloon on the tip of each funnel. Step 2: Using funnel, slowly pour a package of Pop Rocks candy into each balloon. Step 3: Remove caps from each soda bottle. Step 4: Place the opening of a balloon on the opening of each soda bottle. Step 5: Lift the balloons up to drop the Pop Rocks candy into the soda bottles. Step 6: Watch as the Pop Rocks candy mixes with the soda to form carbon dioxide gas. Step 7: Watch to see which balloon fills with the most carbon dioxide gas. Step 8: Using measuring tape, measure and record the circumference of each balloon. Step 9: Compare the results. ​There aren't any special safety procedures. All materials used in this experiment are safe. You will need a flat table surface to place the four bottles of soda in a line. For Science night we will let students help with the procedure. A private classroom would be great so that passing students don't see the results of our experiment before they get to come to us. ​A few seconds after the Pop Rocks candy went into the soda, the Pop Rocks candy turned the soda into carbon dioxide, and then it turned into bubbles. We also noticed it took a few seconds to dissolve. Then the bubbles filled up the rest of the soda bottle and went up and filled into the balloon. The bottle of Diet Coke produced the most carbon dioxide. The bottle of Sprite produced the least about of carbon dioxide. The Pop Rocks candy will turn into carbon dioxide and fill the empty balloons. When the Pop Rocks candy are mixed with different soda types different amounts of carbon dioxide is created. This is a chemical reaction that happens which causes the Pop Rocks candy to turn into carbon dioxide. The carbon dioxide in the Pop Rocks candy and the carbonated water in all of the sodas created the carbon dioxide gas. Our conclusions are that the Pop Rocks candy does dissolve in the soda and turns into carbon dioxide and fills the balloons with the carbon dioxide that can't fit into the bottle. The bottle of Coke and Diet Coke were very close in the carbon dioxide that was produced, but the Diet Coke overcame it by a small margin. I like to play sports, and I like science and math. I like to go to the beach and going​ skiing. I play basketball, soccer and lacrosse and like comedy movies. I also like math and science.